Join us this February half term and enjoy fantastic value combined train and aquarium tickets. Board the train at Lakeside or Haverthwaite and enjoy a fun filled journey. 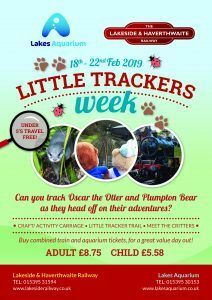 Grab a tracker quiz trail and track the journey of our mascots Plumpton the bear and Oscar the otter. Once inside the aquarium there are more animal tracks to discover, take your time and discover amazing things under the microscope and get up close to some amazing creatures during the animal handling sessions.